For Valentines Day 2011 it is a pleasure to present this month’s Large Igneous Province (LIP)—Artemis (named for the Greek goddess of the hunt) that forms a portion of Aphrodite Terra (named for the Greek goddess of love), on Earth’s sister planet, Venus—the Roman goddess of love. Venus’ Artemis forms a feature that is both spectacular and unique (perfect for any Valentine gift). Spectacular because Artemis’ signature extends over a 13000 km diameter area of Venus’ surface and its formation likely involved the planet’s core, mantle and lithosphere; and unique, because there is no similar feature recognized on Venus—or any other planet to date. 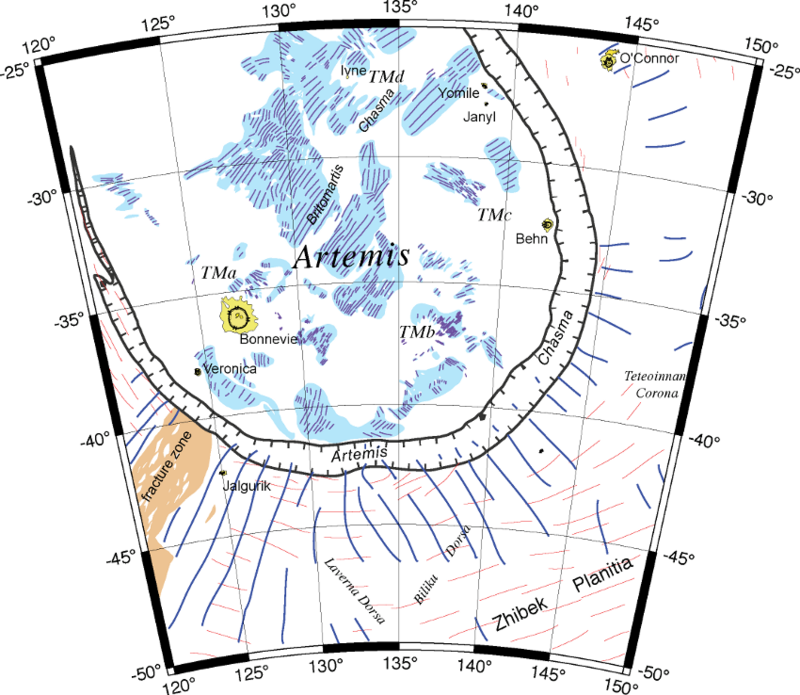 As historically defined Artemis includes an interior topographic high surrounded by Artemis Chasma (a 2100-km-diameter, 25–100-km wide, 1–2-km-deep nearly complete circular trough) and an outer rise (2400 km diameter) that transitions outward into the surrounding lowland. However, recent geologic mapping indicates that the traditional view of Artemis included only the center ‘seed pod’ of a much more expansive axisymmetric Artemis (Fig. 1), with an additional broad topographic trough (5000 km diameter) and suites of radial dikes and concentric wrinkle ridges extending in petal-like fashion away from the recognized center, with diameters of 12,000 and 13,000 km, respectively (Hansen & Olive 2010). This LIP-of-the-Month contribution briefly summarizes the results of earlier work. Figure 1. A: Mollweide projection of Venus showing Magellan altimetry, fracture zones (from Price & Suppe 1995) (stipple), wrinkle ridge trajectories (red and white; from Price & Suppe 1995), and radial fracture trends (black). Major geomorphic features: crustal plateaus (pA—Alpha Regio; pF—Fortuna Tessera; pO—Ovda Regio [in D]; pTe—Tellus Regio; pTh—Thetis Regio [in D, E]), volcanic rises (Atla Regio; rB—Beta Regio; rBl—Bell Regio; rD—Dione; rEc—central Eistla Regio; rEe—eastern Eistla Regio; rEw—western Eistla Regio; rL—Lada Terra; rI—Imdr Regio; rT—Themis Regio), Phoebe Regio (Ph), Lakshmi Planum (LP), Rusalka Planitia (RP), Niobe Planitia, Ishtar Terra, western and eastern Aphrodite Terra, and Artemis trough in dark blue. Wrinkle ridge trends in intratessera basins in western Aphrodite are exaggerated for illustration. Thin black polygon marks map area. Thick white line demarks newly defined Artemis. 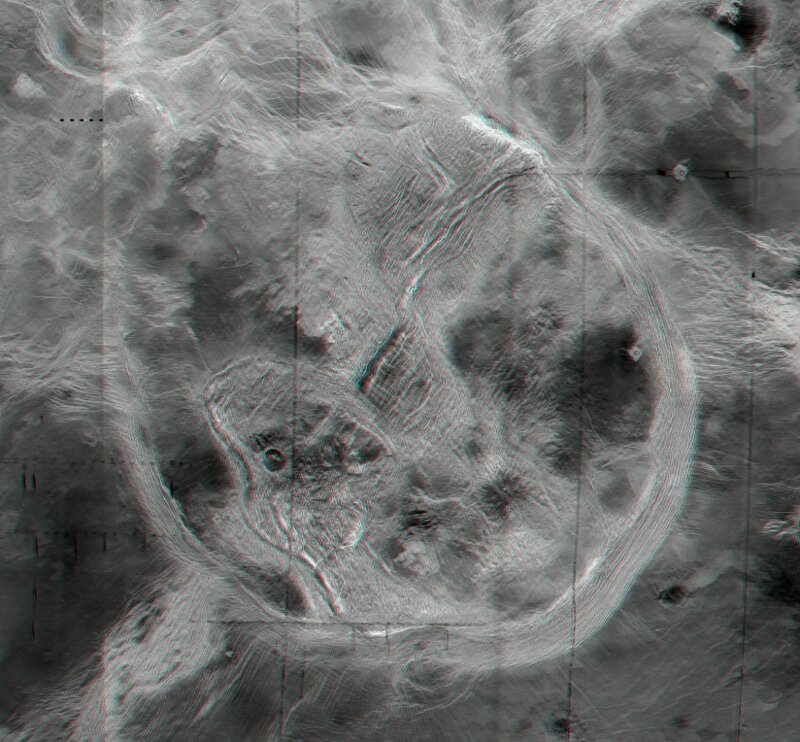 B: Example synthetic aperture radar image of fractures (fr) and wrinkle ridges (wr). C: Map of fractures and wrinkle ridges. D: Orthographic view of a virtual globe to the west of Artemis (A) with Magellan gravity (low—black; high—light), wrinkle ridge (red) and radial fracture (yellow) trends, fracture zones (from Price & Suppe 1995) (green), and Artemis chasma (pink); symbols as in A. E: View of virtual globe to the east of Artemis. rA—Atla Regio. Figure modified from Hansen & Olive (2010). The enigmatic nature of Artemis has perplexed researchers since acquisition of Pioneer Venus data in the late 1970s. Although Venus’ surface abounds with circular to quasi-circular features at a variety of scales, including from smallest to largest diameter features: small shield edifices (>1 km), large volcanic edifices (100—1,000 km), impact craters (1–270 km), coronae (60—1,010 km), volcanic rises and crustal plateaus (~1,500 – 2,500 km), Artemis defies classification into any of these groups. Artemis dwarfs Venus’ largest impact crater, Mead (~280 km diameter); Artemis also lacks the basin topography, multiple ring structures, and central peak expected for large impact basins. Topographically, Artemis may resemble some Venusian coronae; however even Artemis’ ‘seed pod’ is an order of magnitude larger than the average corona (200 km) and about twice the size of Venus largest corona, Heng-O Corona (1,010 km in diameter). In map view the size and shape of Artemis’ interior and chasma resemble volcanic rises and crustal plateaus; however, both of these classes of features differ topographically from Artemis. Volcanic rises and crustal plateaus form broad domical regions, and steep-sided regions with flat tops, respectively; neither rises nor plateaus include circular troughs. So although it seems clear what Artemis is not, there is little consensus about what Artemis is, except that Artemis is indeed one of a kind. Artemis’ true size emerged during the earliest stages of mapping of Venus’ Niobe and Aphrodite 1:10 million map sheets (57°N-57°S; 60-180°E)—a project that is just beginning. Initial mapping focused on regionally distributed wrinkle ridges, and regionally distributed structural elements including local fractures (defining radial or concentric patterns associated with coronae, mons, or volcanoes) and regional fractures (elements not obviously part of a local suite, and that lie outside extensive fracture zones) (Figs. 1B, 1C). Wrinkle ridges, which are marked by distinctive sinuous ridges, represent modest (<2%–5%) distributed surface-layer contraction (Watters 1992; Mége & Reidel 2001). For the purpose of mapping, ‘regional fractures’ include fractures, fissures, and graben—all structures that form sharp straight lineaments in NASA Magellan synthetic aperture radar data. Graben and fissures show resolvable troughs, whereas fractures do not. Fractures (including fissures and graben) are interpreted to represent subsurface dikes (Head et al. 1992; McKenzie et al. 1992b; Grosfils & Head 1994a; Ernst et al. 2001, 2003). Although regional fractures occur across the map area, of particular interest here are fractures that trend at a high angle (essential perpendicular) to regional wrinkle ridges (Fig. 1B and C), here referred to as radial fractures. The wrinkle ridge map, consistent with previous global-scale map efforts (e.g., Price & Suppe 1995; Bilotti & Suppe 1999), reveals a broadly coherent pattern concentric to Artemis (Fig. 1; the regional wrinkle ridge patterns are displayed here as wrinkle ridge trajectories that parallel wrinkle ridge trend in the same way that foliation trajectories describe foliation trends in terrestrial gneissic terrains; see Hansen and Olive  for a detailed lineament map available in the Geological Society of America Data Repository). Radial fracture trends describe pattern radial to Artemis. Both wrinkle ridges and radial fracture locally deform parts of western Aphrodite Terra north of Artemis Chasma. Wrinkle ridges deform the fill of local basins located at high elevations in crustal plateaus Ovda and Thetis Regiones; wrinkle ridge trends parallel regional trends independent of the orientation of host basins. Radial fractures locally transect the highland region. The traditional view of Artemis includes an interior region, Artemis Chasma, and an outer high (Figs. 2 and 3), as summarized from the USGS 1:5 million scale geologic map of the Artemis quadrangle (V-48), which encompasses most of Artemis as traditionally defined (Bannister & Hansen 2010). The interior hosts four spatially and temporally overlapping tectonomagmatic centers (TMa-d), Britomartis Chasma that trends northeast through the northernmost tectonomagmatic center (TMd), and a tectonic terrain marked by a distinctive penetrative tectonic fabric (Fig. 3). Outside and exterior to the chasma an extensively developed suite of closely-spaced wrinkle ridges broadly parallels the concentric trace of the chasma. A 300-km-wide fracture zone trends northeast toward the chasma along the southwestern margin. Locally, flows sourced from interior tectonomagmatic centers extend across the western part of the chasma; the flows are locally buttressed by topographic expression of the chasma tectonic fabric along the south and east margins. These relations indicate that evolution of the interior region and the chasma temporally overlapped, at least in part. Temporal relations between the chasma and the fracture zone are unclear, although broadly synchronous evolution of the chasma trough and the fracture zone are most consistent with geologic relations (Bannister & Hansen 2010). Figure 2. Red-blue anaglyth synthetic stereo image of Artemis Chasma, interior, and region outboard of Artemis Chasma. Scale is purposefully left off the image so that readers may easily ‘fly’ above Artemis and zoom in locally to see details. For latitude/longitude see figure 3. Figure 3. Lambert projection of Artemis quadrangle (V-48) structural sketch map highlighting tectonic patterns with regard to Artemis Chasma (hatchered line); penetrative tectonic fabric (blue fields with purple lines marking trends; blue lines mark fracture trends) outcrops in the interior of Artemis; radial fractures and faults (thick blue lines) and concentric wrinkle ridges (red lines) occur within the exterior region. Structures within Artemis Chasma parallel the trace of the chasma. Note that the chasma and exterior structures share a center point. Tectonomagmatic centers (TMa-d) lie within Artemis’ interior region, and mark regions in which the penetrative fabric changes local trend. Named impact craters shown in yellow. Modified from Bannister and Hansen (2010). Artemis Chasma forms a well-defined circular trough, which, defined topographically by radial clock position, extends from ~12:00 clockwise to 10:30, with its deepest and steepest topographic expression occurring from ~2:00 clockwise to 7:00 (Figs. 2 and 3). The chasma ranges in width from 25 to 200 km and displays an average relief of 1-2 km. The chasma appears to be defined first topographically, and second in terms of secondary structures; no material units define the chasma, and no units obviously embay the chasma. 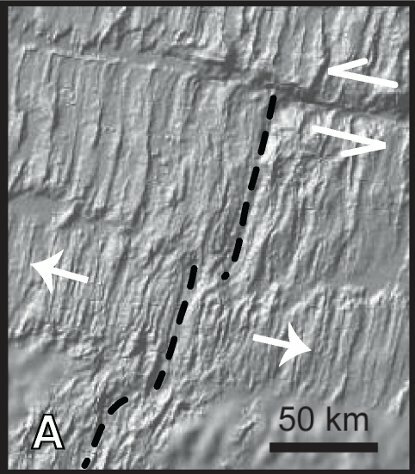 Artemis Chasma hosts a tectonic fabric consisting of closely-spaced trough-parallel lineaments with increasing intensity (decrease in spacing) clockwise to the southeast, and decreasing intensity (increase in spacing) to the northwest (Brown & Grimm 1995; Hansen 2002). 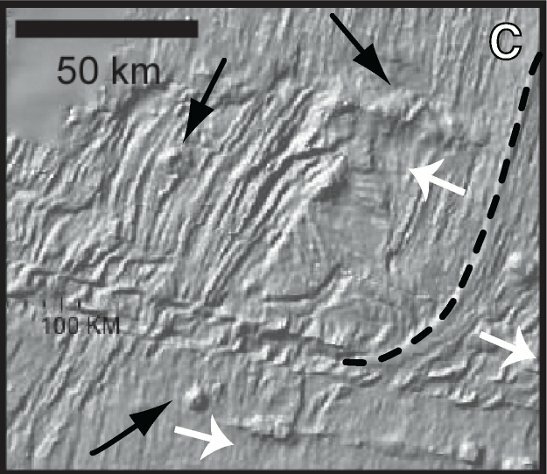 The lineaments appear to form smooth ridges within the trough and along the inward facing (outside) chasma wall—consistently interpreted as a fold crest (Brown & Grimm 1995; Hansen 2002; Bannister & Hansen 2010). The character of the lineaments along the interior chasma (outside facing) could be a combination of fractures, faults, and folds. Regardless of character the lineaments everywhere generally parallel the trend of the trough locally defining a chasma penetrative fabric, wherein the lineaments are at the effective resolution of the Magellan SAR data. At ~10:30, where the chasma narrows in width and shallows and fades topographically, chasma lineaments appear to become wrinkle ridges, parallel in trend to the trough, but with slightly increased spacing. There is no evidence that the trough or trough lineaments are buried by younger material; obvious embayment relations are lacking. For more detail about chasma structures see Brown and Grimm (1995) and Hansen (2002). The material that comprises the chasma, a homogeneous radar smooth unit, appears contiguous with exterior material across much of the chasma, and contiguous with both the interior and exterior along the northwest region where the chasma lacks strong topographic definition. In general the chasma is marked by wrinkle ridges and folds with axes parallel to the concentric form of the chasmata, and by fractures that trend normal to the chasma. Bannister and Hansen (2010) present arguments that the chasma formed through progressive outward displacement of a trough, essentially deforming the ‘overlying’ surface at it was displaced outward—following the original proposal of Griffiths and Campbell (1991) based on their laboratory experiments. The interior of Artemis includes a distinctive penetratively developed tectonic fabric, four tectonomagmatic centers (TMa-d)—defined by radial and/or concentric fractures or lineaments and discrete flows—and Britomartic Chasma, which extends from the near center of Artemis to the northeast chasma margin. The four tectonomagmatic features broadly post-date formation of the adjacent and locally underlying penetrative fabric, although locally flows might be reactivated along fabric-parallel structures. Britomartic Chasma trends northeast across the northern interior. 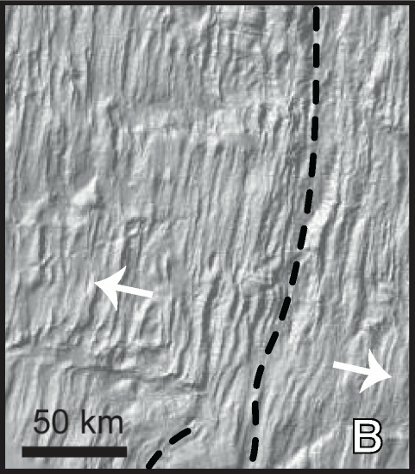 Britomartic Chasma differs from most other chasmata on Venus in that: 1) it is <1,000 km in length (short for Venus), 2) it is not associated with an obvious corona chain, and 3) it is marked by smooth fold-like ridges (and troughs) rather than chasma-parallel fractures (for example, Diana-Dali Chasmata [Hansen & DeShon 2002], Jana, Kuanja and Ralkumgu Chasmata [Bleamaster & Hansen 2005], Devan Chasma [V-41 and V-29]). Britomartic Chasma hosts small flows that fill local topographic valleys (Brown & Grimm 1995; Spencer 2001; Hansen 2002). 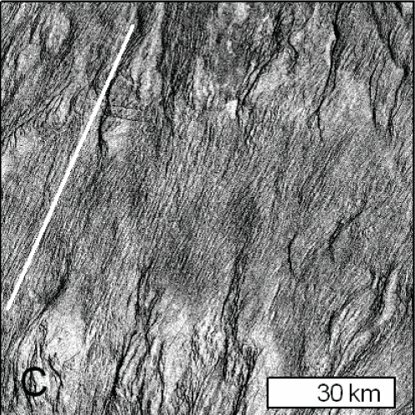 The penetratively-developed tectonic fabric that characterizes much of Artemis’ interior has not been described anywhere else on Venus, and as such its presence contributes to Artemis’ unique character. The fabric consists of tightly spaced lineaments (Fig. 4). The lineaments display a generally consistent northeast trend; however, locally lineaments change trend in apparent spatial association with local tectonomagmatic centers. SAR images provide clues about the cross-sectional topographic shape of the penetrative fabric and therefore fabric morphology. The fabric is generally marked by smooth, likely symmetric, low-amplitude, rounded or smooth ridges and troughs. Penetrative fabric wavelength is generally consistent across Artemis based on detailed transect measurements, ranging from 300-730 m (520±125 m average). Because these wavelengths are essentially the effective resolution (Zimbelman 2001) of Magellan SAR data, a shorter (tighter) wavelength is possible. Figure 4. Representative inverted left-look SAR images of Artemis’ penetrative fabric; white lines parallel fabric trend; (center coordinates); A) (127°41’E, 30°38’S); B) (136°29’E, 27°59’S); C) (130°16’E, 30°42’S); D) (129°39’E, 32°38’S). Fabric appears fracture-like in A and D, and ridge-like in B and C (more common). Note the delicate interfingering of radar-smooth (light in color, low-backscatter) material with penetrative fabric (A and D), indicating: 1) the topographic expression associated with the penetrative fabric, 2) that the cover material forms a thin layer emplaced after fabric development, which 3) appears to have been low viscosity during emplacement; local cutting of the cover material by penetrative fabric trends likely represents reactivation of the buried penetrative fabric, and, in turn suggests that penetrative fabric structures were locally reactivated following the emplacement of the cover material. Modified from Bannister and Hansen (2010). The penetrative fabric occurs mostly with the center of Artemis’ interior extending locally to areas of the tectonomagmatic structures. Contact relations are generally gradational marked by a gradual decrease in radar backscatter character; fabric-parallel lineaments remain easily identifiable but appear slightly subdued. The subdued appearance may reflect weathering, varying degrees of burial by thin flows or aeolian fines, and/or reactivation of buried fabric structures (Fig. 4). Low-backscatter material delicately interfingers with the penetrative fabric locally indicating that the low-backscatter material constitutes a thin veneer, marked by low viscosity during its emplacement, as would be required to fill the long, narrow, and shallow valleys without completely burying the penetrative fabric. The low-backscatter material is interpreted as consisting of local volcanic deposits. A sedimentary origin is unlikely owing to the present lack of significant erosion rates on Venus and the pristine appearance of adjacent rocks (and lack of evidence for erosion or dissection) that would be the most probable source of sediment. In addition, a sedimentary origin might be expected to be less sensitive to local topography. Penetrative fabric-parallel lineaments in the low-backscatter material likely reflect the reactivation of buried penetrative fabric structures. 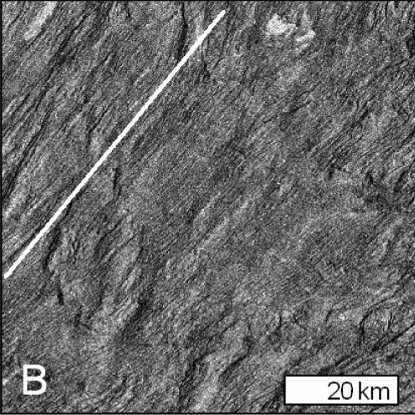 The tectonic fabric, marked by closely spaced lineaments comprises the lowest locally exposed level of Artemis’ interior, and yet it is likely that the fabric in the center of Artemis is younger than, or possibly synchronous with) the development of the tectonomagmatic centers (Bannister & Hansen 2010). Bannister and Hansen (2010) provide a detailed description and discussion of the penetrative fabric character and possible modes of formation. Based on detailed map relations and wavelength arguments, these workers favor the hypothesis that Artemis’ penetrative fabric formed progressively as the ‘layer’ itself formed, much like the fabric that characterizes terrestrial ocean crust parallel to, and observed along, submarine spreading centers. They suggest that Artemis’ penetrative fabric appears morphologically similar to surfaces along terrestrial mid-ocean ridges viewed in high-resolution shaded relief maps posted on the Ridge Multibeam Synthesis (RMBS) Data Portal website (Fig. 5). The terrestrial RMBS shaded relief maps and Venusian SAR images might be comparable in that both provide views of the detailed topographic character of planet surfaces. Unfortunately high-resolution views of this distinctive terrestrial tectonic fabric are not available across large regional areas away from the ridge axes; this lack of availability makes regional comparison with Artemis’ penetrative fabric difficult. Despite this shortcoming, Bannister and Hansen (2010) favor formation of Artemis’ penetrative fabric in a manner similar to terrestrial spreading center fabric—that is, marking the formation of new crust, with cross-strike time-transgressive evolution. In this case Artemis’ penetrative fabric would not mark deformation of a previously existing layer (hence a secondary tectonic fabric), but rather it would reflect the formation of crust, and as such, the penetrative fabric might more correctly be considered a primary tectonic fabric that formed with the evolution/emplacement of the material unit/crust. Within the context of this scenario, the layer need only be thin at the location of its formation, and it could thicken from below as a result of under-plating, as the surface/crust translates away from the spreading center with the formation of new crust, as is the case for Earth’s oceanic crust. Figure 5. High resolution shaded relief images of terrestrial spreading centers from the Ridge Multibeam Synthesis (RMBS) Data Portal website (http://www.marine-geo.org/rmbs/). A) The Mid-Atlantic Ridge centered at 29°N30’/43°W; the ridge trough trends from the upper right to lower left, with a left-lateral transform fault to the right of the ridge trough and a fracture zone to the upper left. B) The Mid-Atlantic Ridge centered at 22°N30’/45°W30’; the ridge trough trends NNE along the right side of the image. C) The southern East Pacific Rise centered at 8°S50’/108°W40’; the NNE-trending ridge lies along the right side of the image; a complex left-lateral transform zone trends WNW in the lower portion of the image; volcanic constructs occur individually and as short chains. In each case high-resolution data exists only near the ridge axis. Ridge axes indicated by dashed black lines; volcanic constructs marked by arrows; relative displacement across ridges and transform faults shown by white arrows. Modified from Bannister and Hansen (2010). Prior to the recognition of Artemis’ huge regional footprint, hypotheses for Artemis’s formation include the following. (1) Artemis Chasma records convergence and subduction (McKenzie et al. 1992a; Brown & Grimm 1995, 1996; Schubert & Sandwell 1995). (2) Artemis’s interior is analogous to a terrestrial metamorphic core complex (Spencer 2001). (3) Artemis formed due to a huge bolide impact on cold strong lithosphere before 3.5 Ga (Hamilton 2005). (4) Artemis represents the surface expression of a mantle plume (Griffiths & Campbell 1991; Smrekar & Stofan 1997; Hansen 2002, 2003; Bannister & Hansen 2010). Bannister and Hansen (2010) propose a hybrid hypothesis that builds on the hypothesis that Artemis represents the surface expression of a deep mantle plume (Griffiths & Campbell 1991; Smrekar & Stofan 1997; Hansen 2002, 2007), and incorporates aspects of the other hypotheses. This hybrid hypothesis can also be modified to incorporate the much more global character of Artemis. The plume hypothesis for Artemis formation initially arose from laboratory plume experiments aimed at modeling the interaction of a thermally driven mantle plume with the lithosphere (Griffiths and Campbell, 1991), and was later embraced by the results of numerical modeling aimed at modeling corona formation (Smrekar & Stofan 1997). Both physical and numerical models resulted in the formation of a circular trough, postulated as analogous to Artemis Chasma. Griffiths and Campbell (1991) also noticed that their physical plume experiments developed small-scale convection cells that compartmentalized the interior of the flattening plume head. 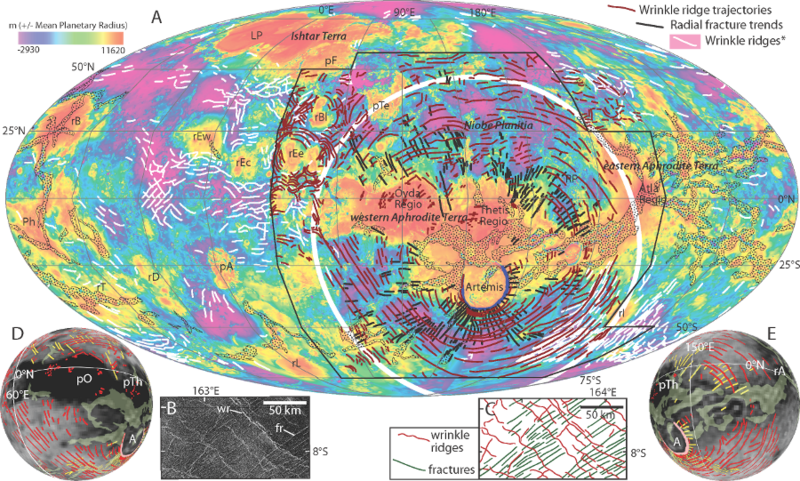 The tectonomagmatic centers might represent subsurface compartmentalization contributing to the evolution of Artemis’ interior region. 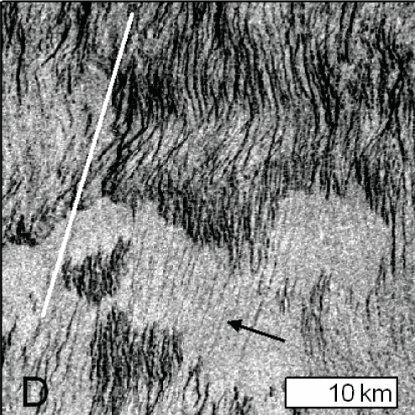 As an alternative to small-scale thermally driven convection cells, Hansen (2002) proposed the formation of compositionally driven diapirs above a flattening plume head to accommodate formation of the localized tectonomagmatic centers in Artemis’ interior. The formation of Artemis’ interior tectonomagmatic centers as diapirs is consistent with numerical modeling of diapirs (e.g., Koch & Manga 1996; Smrekar & Stofan 1997). The plume hypothesis also accommodates crustal heterogeneity, which could influence strain partitioning and prevent map patterns idealized from physical and numerical models from developing. Within the context of the plume hypothesis, Artemis’ topography should reflect a raised interior region, consistent with the observed topography of a raised interior region surrounded by a 1- to 2-km- deep chasma. Furthermore Artemis Chasma would have formed a coherent entity broadly synchronous with interior volcanic deposits and deformation, and deformation in the exterior. This prediction is consistent with the continuity of chasma structures, radial fractures and concentric exterior wrinkle ridges that strongly suggest a genetic relationship and broadly contemporaneous formation, consistent with geologic relations. The interpretation that Artemis represents the surface manifestation of a mantle plume on thin lithosphere, is consistent with Artemis’ (traditionally recognized) large size and circular planform. Gravity-topography analysis, though not unique, is consistent with at least partial dynamic support for Artemis (Simons et al. 1997). However, contemporary dynamic support requires a contemporary age for Artemis—a prediction that we can neither support nor reject based on currently available data. As a deep-mantle plume rises toward the lithosphere, the lithosphere will be uplifted, and, if the strength of the lithosphere is exceeded, radial fractures could form above the plume head. An alternate scenario is if the lithosphere were sufficiently heated it might develop a penetrative tectonic fabric. A circular trough could also form, as illustrated in laboratory experiments aimed at modeling the interaction of thermal plumes with the lithosphere (Griffiths & Campbell 1991). In these experiments, as a plume head approached the rigid horizontal boundary, it collapsed and spread laterally. A layer of surrounding ‘mantle’, squeezed between the plume and the surface, resulted in a gravitationally trapped asymmetric instability, and this process led to the formation of an axisymmetric trough. In addition, the interior squeezed layer might lead to convection on a scale smaller than that of the original plume. These smaller scale instabilities could interact with the lithosphere inside the trough, and become manifested as the tectonomagmatic centers. It was on the basis of these laboratory experiments that a plume model for Artemis formation was first proposed following initial release of Magellan SAR data (Griffiths & Campbell 1991). Finite-element models of the interaction of a large thermal plume with lithosphere, aimed at modeling corona topography, also show development of an axisymmetric trough above large thermal mantle plumes (Smrekar & Stofan 1997). In this case the trough results from delamination of the lower lithosphere. Delamination might contribute to a hybrid model that incorporates aspects of plume-lithosphere interactions with signatures that some workers propose might be better addressed through subduction (e.g. McKenzie et al. 1992a; Brown & Grimm 1995; Schubert & Sandwell 1995; Brown & Grimm 1996). However, subduction vergence would be the opposite of that originally proposed in the Artemis Chasma subduction zone hypotheses, in which the interior formed the upper plate and the region outside Artemis Chasma represented the subducting lower plate. The hybrid hypothesis builds on the plume hypothesis but incorporate aspects of other hypotheses as well. The hypothesis embodies two important postulates. Artemis represents a singular geomorphic-tectonomagmatic feature, and as such, the interior, chasma and exterior evolved together. And various parts of Artemis formed transgressively, both spatially and temporally. Indeed it seems clear that Artemis marks the surface expression of a large mantle plume that emerged within a broad mantle upwelling or thermal anomaly; the interaction of the upwelling, the plume, and the lithosphere resulted in significant rheological differences across the exterior, interior and chasma regions. The exterior preserves a distal record of the initial plume-lithosphere interactions, as reflected in radial and concentric structures; the interior records the formation of new crust at a terrestrial-like spreading center and associated tectonomagmatic activity during plume evolution; the chasma preserves parts of crust modified directly above the plume early in plume-lithosphere interactions, and subsequently shortened during the evolution of the plume. A series of time-step cartoons illustrates salient features of the hybrid hypothesis, beginning with the arrival of a deep mantle plume at the base of relatively thin lithosphere (Fig. 6). Part of the crust resides above a broad mantle upwelling (marked by the exterior fracture zone) where the crust is thinned, thermally and/or mechanically, relative to its global counter part (time 0). With arrival of a more focused plume head (time 1), the lithosphere/crust was uplifted due to thermal buoyancy, resulting in the formation of radial fractures now preserved in the region outside Artemis Chasma (which forms later). The area above the plume thins (light-gray region forming the interior of Artemis to be), and there is a fundamental rheological boundary between the interior crust affect by the plume, and exterior crust, which lay outside the spatial limits of thermal-rheological influence of the plume. As the plume head flattens and spreads the plume tail delivers magma to the surface, forming a nascent spreading center, also likely fed by pressure-release melting in the mantle (time 2); the penetrative fabric preserves a record of this newly formed crust, geomorphically similar to the crust formed at terrestrial mid-ocean ridges. With time, the ‘spreading center’ begins to organize in a linear fashion (likely with offsets, not shown for simplicity) and propagates along strike (time 3). As new crust forms at the spreading center the previously formed crust is displaced outward from the spreading center; a trough develops within the modified crust (light gray), possibly along its boundary with the newly formed crust, marked by penetrative fabric. The trough moves outward with continued spreading and propagation of the spreading center. The translation is driven both by spreading and new crust formation at the surface, and dynamics at the plume-lithosphere interface (from below; as in the case of laboratory experiments). Tectonomagmatic centers form locally within the region thinned by initial plume-lithosphere interaction (time 4, time 5). Once the thinned/modified crust and the newly formed crust (marked by the penetrative fabric) meet the relatively unmodified crust (in that region exterior to the current chasma), the trough (chasma) can no longer move outward as the crustal rheology is simply too strong and resists deformation (time 6). Spreading need not have occurred at a single spreading center, but rather could have occurred across various parts of Artemis’ interior. Figure 6. 3D block cartoon sequence (time 1 to time 6) illustrating hybrid hypothesis for Artemis formation and evolution. Note that diagrams look southward across Artemis. See text for discussion. Modified from Bannister and Hansen (2010). Within the context of this hybrid hypothesis the interior, exterior, and chasma formed as genetically related features, each evolving through time, and related to the evolution of a plume-lithosphere interaction. The plume’s interaction with the lithosphere (or lack thereof) would account for strong rheological variation at a crustal-scale across the region as shown in figure 6. The trough (chasma) represents a sort of nascent, but failed, subduction zone with the exterior region lying in an upper-plate position relative to the interior ‘lower-plate’. This proposal differs from the subduction hypothesis, which calls for northwest-directed subduction of the lowland under the Artemis interior (which would lie in an upper-plate position). The hypothesis differs from the metamorphic core complex hypothesis in that interior extension results in the formation of new crust, rather than the exposure of mid- to deep-level crust within Artemis’ interior. The hybrid hypothesis is similar to each of these in that it calls for shortening of the surface crust within Artemis Chasma—which moves outward with time. And it calls for northwest-southeast directed extension across the interior of Artemis. With regard to the impact hypothesis, it is possible that the mantle plume formed in response to a large bolide (>20-30 km diameter) impact on thin lithosphere, with the interior region representing a region of greatly thinned and modified crust as a result of the impact event and subsequent massive partial melting in the mantle (for example, Jones et al. 2005; Elkins-Tanton & Hager 2005). (Morphologically the feature would look nothing like Mars’ Hellus Basin, which would have been an analog features based on the original proposal (Hamilton 2005). In this case the plume called for in time steps 1-6, could have formed in response to large bolide impact with a thin global lithosphere (e.g., Wichman & Schultz 1995), rather than the result of strictly endogenic processes. At this point we cannot favor plume formation via one mechanism over another (for example, endogenic rise of a deep mantle plume, or in response to an exogenic catastrophe); however, a thin lithosphere would be required in either case. The newly recognized extent of Artemis would seem to suggest that the plume that formed Artemis as traditionally defined, was likely part of a larger superplume system (e.g., Courtillot et al. 2003), adding the evolution of the huge radial dike swarm (12000 km diameter) affecting a broad area comprising ~25% of the surface of Venus. These dikes served to distribute magma over a large area, although lava did not leak to the surface everywhere within the region, as evidenced by the surface expression (and preservation) of portions of the radial dike system. Lava flows that did emerge were later deformed by wrinkle ridge structures, together with other pre-existing surface deposits that formed from a wide range of eruptive centers active over a broad period of time. The formation of the wrinkle ridges across 13000 km diameter region, and that of the broad topographic trough (~ 5000 km diameter), would seem to have been formed with the decay/relaxation/cool of a broad deep superplume. The incredible size and radial nature of the dike swarm, and the concentric nature of the wrinkle ridge pattern provide evidence of a huge axisymmetric global stress field. Artemis’s global-scale manifestation could have implications for lateral transfer of heat in the crust and to near-surface environments and mantle flow. In terms of mantle flow, it is perhaps plausible that Ishtar Terra, Venus’ other large unique feature, acquired its unique topographic status formed in concert with Artemis—representing a near-antipodal feature. Ishtar Terra is proposed as of a site that collected mantle melt residuum formed by a large-scale ancient mantle downwelling (Hansen & Phillips 1995). These workers suggest that ponded partial melt residuum compensates the long-wavelength bulge of Ishtar Terra, in the spirit of the tectosphere that extends beneath terrestrial continents (Jordon 1975, 1981). Thus, is it possible that near-antipodal mantle down flow associated with an Artemis superplume may have resulted in displacement and collection of partial melt residuum beneath Ishtar Terra. In this view Venus’ two unique features, Artemis and Ishtar Terra, might be genetically related though recording opposite parts of a global event. The size of Artemis’s radial fracture suite exceeds radial swarms recognized elsewhere, but they are proportionally similar to Mars’ Tharsis-radial dike system (Wilson & Head 2002) as compared to host planet size. As with the Tharsis system, future study of Artemis, both as traditionally defined, and as newly recognized ‘super’ Artemis, should provide rich fodder for modeling terrestrial planet dike propagation, plume-lithosphere interaction, superplume-plume evolution, and mantle geodynamics. Bannister, R. A., and V. L. Hansen (2010), Geologic map of the Artemis quadrangle (V-48), Venus, U.S. Geological Survey, SIM 3099, 1:5 M scale. Bilotti, F., and J. Suppe (1999), The global distribution of wrinkle ridges on Venus, Icarus, 139, 137-157. Bleamaster, L. F. I., and V. L. Hansen (2005), Geologic map of the Ovda Regio quadrangle (V-35), Venus, U.S. Geological Survey, I-2802, 1:5 M scale. Brown, C. D., and R. E. Grimm (1995), Tectonics of Artemis Chasma: a Venusian "plate" boundary, Icarus, 117, 219–249. Brown, C. D., and R. E. Grimm (1996), Lithospheric rheology and flexure at Artemis Chasma, Venus, JGR, 101, 12697-12708. Courtillot, V., et al. (2003), Three distinct types of hotspots in the Earth’s mantle, EPSL, 205, 295– 308. Elkins-Tanton, L., and B. Hager (2005), Giant meteoroid impacts can cause volcanism, Earth and Planetary Science Letters, 239, 219–232. Ernst, R. E., et al. (2001), Giant dyke swarms on Earth, Venus and Mars, AREPS, 29, 489-534. Ernst, R. E., et al. (2003), Graben-fissure systems in Guinevere Planitia and Beta Regio (264-312E, 24-60N), Venus, and implications for regional stratigraphy and mantle plumes, Icarus, 164, 282–316. Griffiths, R. W., and I. H. Campbell (1991), Interaction of mantle plume heads with the Earth's surface and onset of small-scale convection, JGR, 96, 18,295-218,310. Grosfils, E. B., and J. W. Head (1994a), The global distribution of giant radiating dike swarms on Venus: Implications for the global stress state, GRL, 21, 701-704. Grosfils, E. B., and J. W. Head (1994b), Emplacement of a radiating dike swarm in western Vinmara-Planitia, Venus - Interpretation of the regional stress-field orientation and subsurface magmatic configuration, EMP, 66, 153-171. Hamilton, W. B. (2005), Plumeless Venus has ancient impact-accretionary surface, in Plates, Plumes, and Paradigms, edited by G. R. Foulger, et al., pp. 781-814, Geological Society of America, Denver. Hansen, V. L. (2002), Artemis: signature of a deep venusian mantle plume, GSAB, 114, 839-848. Hansen, V. L. (2003), Venus diapirs; thermal or compositional?, GSAB, 115, 1040-1052. Hansen, V. L. (2007), LIPs on Venus, Chem. Geol., 241, 354–374. Hansen, V. L., and H. R. DeShon (2002), Geologic map of the Diana Chasma Quadrangle (V-37), Venus, U.S. Geological Survey, I-2752, 1:5 M scale. Hansen, V. L., and A. Olive (2010), Artemis, Venus: The largest tectonomagmatic feature in the solar system?, Geol., 38, 467-470. Hansen, V. L., and R. J. Phillips (1995), Formation of Ishtar Terra, Venus: Surface and gravity constraints, Geol., 23, 292-296. Head, J. W., et al. (1992), Venus volcanism: Classification of volcanicfeatures and structures, associations, and global distribution from Magellan data, JGR, 97, 13153-13198. Jones, A. P., et al. (2005), Impact volcanism as a possible origin for the Ontong Java Plateau (OJP), in Plates, Plumes, and Paradigms, edited by G. R. Foulger, et al., pp. 711-720, Geological Society of America. Jordan, T. H. (1975), The continental tectosphere, Geophys. Space Physics, 13, 1-12. Jordan, T. H., 1981, Continents as a chemical boundary layer. Royal Society London of Philosophical Transactions, ser. A, 301, 359-373 (1981), Continents as a chemical boundary layer, Roy. Soc. London Philo.Trans., ser. A, 301, 359-373. Koch, D. M., and M. Manga (1996), Neutrally buoyant diapirs: A model for Venus coronae, GRL, 23, 225-228. McKenzie, D., et al. (1992a), Features on Venus generated by plate boundary processes, JGR, 97, 13533-13544. McKenzie, D., et al. (1992b), Dike emplacement on Venus and on Earth, JGR, 97, 15977-15990. 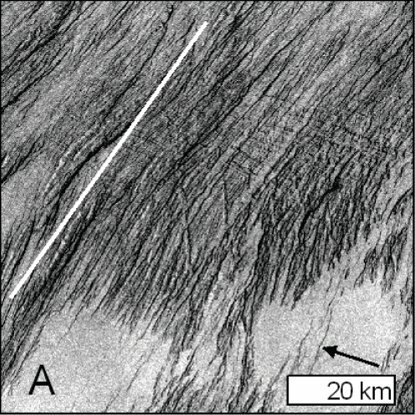 Mége, D., and S. P. Reidel (2001), A method for estimating 2D wrinkle ridge strain from fault displacement scaling applied to the Yakima folds, GRL, 28, 3545-3548. Price, M., and J. Suppe (1995), Constraints on the resurfacing history of Venus from the hypsometry and distribution of tectonism, volcanism, and impact craters, EMP, 71, 99-145. Schubert , G., and D. T. Sandwell (1995), A global survey of possible subduciton sites on Venus, Icarus, 117, 173-196. Simons, M., et al. (1997), Localization of gravity and topography: constraints on the tectonics and mantle dynamics of Venus, GJI, 131, 24-44. Smrekar, S. E., and E. R. Stofan (1997), Corona formation and heat loss on Venus by coupled upwelling and delamination, Sci., 277, 1289-1294. Spencer, J. (2001), Possible giant metamorphic core complex at the center of Artemis Corona, Venus, GSAB, 113, 333-345. Watters, T. R. (1992), System of tectonic features common to Earth, Mars and Venus, Geol., 20, 609-612. Wichman, R. W. (1995), Crater morphometry on Venus: relative crater floor size and internal crater modificaiton, LPSC XXVI, 1497-1498. Zimbelman, J. R. (2001), Image resolution and evaluation of genetic hypotheses for planetary landscapes, J. Geomorph., 37, 179-199.